Colourful models from Smeg lined the catwalk at the recent launch event in Dolce&Gabbana’s Milan headquarters. 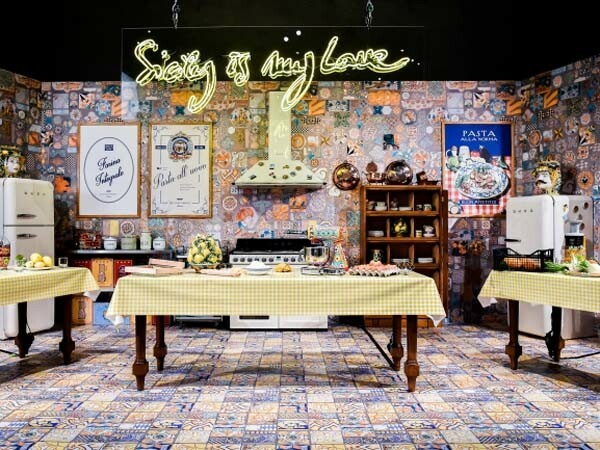 With leading international fashion and design media in attendance, ‘Sicily is my Love’, the latest collaboration between Smeg and famed Italian fashion house, Dolce&Gabbana was unveiled. However, instead of beautiful models in couture walking the ramp, the catwalk was lined with couture for the home in the form of bespoke Sicilian market stalls showcasing Smeg stand mixers, toasters, kettles and blenders adorned with Dolce&Gabbana’s signature decorative style. The stage was styled to resemble a traditional Sicilian farmhouse kitchen complete with Smeg Victoria freestanding cooker and FAB by Smeg fridges. The collection, Sicily is my Love, is a tribute to Domenico Dolce and Stefano Gabbana’s Sicilian home with the Smeg appliances richly decorated with golden lemons, prickly pears, bright red cherries and florals inspired by the coast and landscape of that region. Smeg’s latest collection features toasters, kettles, blenders, stand mixers and coffee machines, all richly decorated in Dolce&Gabbana’s signature style to bring couture level design to the home.